Soft, gooey, autumn treat that is sure to satisfy. 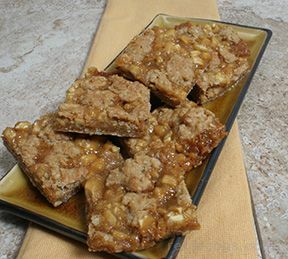 Fresh apples and caramel topping are used to give a caramel apple flavor to these bars. Use our apple guide to select the best apple to use. 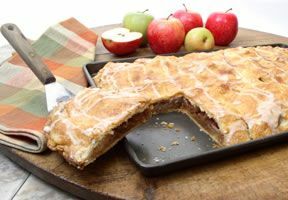 Also, see All About Apples to learn how to prepare them for other apple recipes. Grease the baking pan with butter or non-stick cooking spray, set aside. In large bowl, combine flour, quick oats, brown sugar, baking soda, and egg. Cut in the butter and mix well until ingredients are crumbly. Remove 1 1/2 cups of the mixture and set aside. Press the crumb mixture into the baking pan, bake for 15 minutes in the oven. 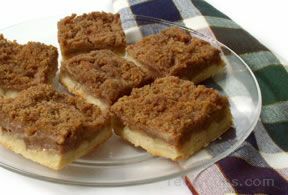 While crust is baking, combine caramel topping and 1/4 cup flour in small bowl; mix well. Sprinkle the apples over the baked crust. Drizzle the caramel mixture over the top of the apples. Sprinkle the remaining crumb mixture over the caramel. Place back in the oven for another 20-25 minutes or until the top is golden brown. Let cool completely before serving; approximately 2 hours. 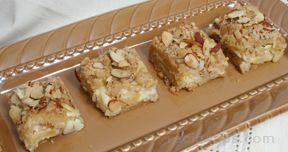 Cut into 2" squares and serve.